Note these tips pretty much apply to any Voice of the Customer or Customer feedback (but not market research) process. So regardless of whether you are using Customer Effort Score, Customer Satisfaction or NPS® you can apply them to your business. To build this the list I mined our own extensive experience in implementing Net Promoter for our customers. I also asked some of the leading people in the customer feedback and Net Promoter community for their very best ideas. NPS is an operational tool and should not be run by market research. Market research is a great tool and allows businesses to understand their market and design new and appropriate products and services but it is not an operational tool. Net Promoter is mostly focused on helping you to understand and improve the day to day operations of the business, reduce waste and improve the customer experience. Using it as a market research tool is like trying using a hammer to drive in a screw: it might work but not very well and you’re very likely to bang your thumb in the process. 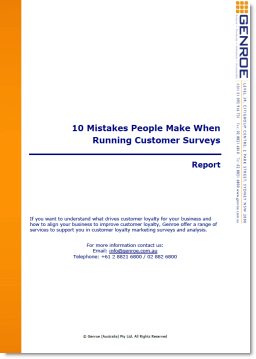 As a corollary to this tip: don’t have your customer feedback program report report in via the Market Research group. They have different cycle times and a different focus. The only reason you’re collecting all this customer feedback data is to identify where to improve your business – so start the process with the understanding that you want to change. For the success of the NPS, consider the humility to recognize the flaws and fix problems quickly. We have to eliminate the distance between the customer wants and what the company is doing. My two cents: This is a great point from Tomas. Too often we are quick to reject feedback from customers as wrong. I know you’ve been in the same meetings as I have. When faced with a negative comment from a customer, the business representative says: “the customer doesn’t understand the process” or “that was a one off”. The beauty of the NPS approach is everyone becomes focused on the customer and the customer experience… as long as you don’t make it about the metric. Use the system to get employees focused on Promoters and doing what it takes to keep them… and understanding why you have Detractors and how to move them to become Promoters. I can’t express enough that it’s not about the metric. It’s not about gaming the system to move the number. It’s about improving the customer experience. Don’t corrupt the use of NPS as an operational improvement tool by using it for performance measurement. NPS — or any measurement — can’t serve both purposes. Using NPS for performance measurement will ensure that those being measured will manipulate the survey processes. My two cents: I’m not sure I agree completely with Fred on this (he already knows) but he makes a very good point. You must be very careful when assigning goals against the feedback your receive. More on this later. How often do you ask your employees the NPS question? What are you doing about improving that score? My two cents: Bill is spot on here. You must have engaged employees to make the process work. The good news is that if you implement your customer feedback process effectively it will also drive employee engagement, so you have a win-win on your hands. Merely satisfying the customer along the experience journey map will not get that customer to tell their friends. Build in “surprise and delight” opportunities within the experience that employees can offer the customer. What would be your company’s version of your bank offering lollipops for children or treats for dogs at the drive-through windows. They know 100% of the customers concerns or complaints because customers tell them every day. Work to eliminate those potential dissatisfiers with the help of your employees. Use the customer’s name. Dale Carnegie said, “Remember that a person’s name is to that person the sweetest and most important sound in any language”. While that may seem common sense, is it common practice? The last five times you used your credit card for a purchase, how many times did the cashier use your name in giving it back to you? Never sit on your laurels. Your competitors are just as intent on improving their NPS as you are. What may be exceptional service from you today may be repeated by your competitor tomorrow. Identify, thoroughly analyze and remove all the potential dissatisfiers that could kill a customer from doing business with you again. My two cents: Later in this list I’ll talk about continuous improvement processes and how valuable that are in Net Promoter. Bill is right about this; to make it work you have to have a cross functional team tasked with driving change. Give it a tagline, a logo, ensure that your program is recognized internally. My two cents: This works very well. For an example have a look at what CCH Australia did in branding their process. It’s best practice. Insert your Net Promoter Score on Executive dashboards. It should be visible to the top. My two cents: The score should be visible but so should the actions that are being taken to change the business. Try not to make the score the only element of the process that gets wide coverage or it may be the only thing that people talk about. Here is a best practice template on how to report your data. You must close the loop with your customers whatever sort of feedback you receive. If you are running a transactional survey then implement service recovery to turn around unhappy customers. You should also be reaching out to high scoring customers to thank them for their support. When using relationship surveys in a B2B company, use an account management approach where you collect the feedback and then review it with the decision makers in your client’s company. In the early months of a new Net Promoter roll-out closing the loop is the most important driver of cultural change in the business so make sure that you implement it early on. Small changes in the survey process can create large changes in the customer feedback score so keep your survey as consistent as possible. Over time you will probably want to change some of follow-up questions in your survey so make sure that the Net Promoter question is the first question that you ask. Even if you change the later questions, the NPS will be consistent because it is the first response provided and so will not be skewed by the other questions. Consistency also applies to the method of asking (internet/telephone/face to face interview) and when you ask (transaction, relationship, same day, a week later). Try to have a consistent process so you don’t misread changes in the skewing of the score to be real changes in the business. If you only survey web customers or buyers of one product type it will not be representative of your overall business. Whenever ever possible try to get feedback from all types of customers and try to make the volume of responses similar to the volume of that type of customer in your business. You don’t want your survey process to break every time that Harry in operations is off sick for the day. Automate as much of routine survey process as possible: invite sending, data collation and reporting. This both lowers your overall cost and reduces the chance that the process will fail because a manual process somewhere just doesn’t get done. The easiest way is to implement software that is NPS aware. You launch your new products properly. You make a big hullabaloo about the sales kick-off for the year. You talk far and wide about the new brand identity marketing just created. So why would the launch of an important process like Net Promoter be any different? If you want to be successful you need to launch this new process with the same fanfare and attention as any other big change in your business. Make sure to apply solid change management principles to the rollout. For many organisations Net Promoter will be a completely different way to think about using customer information and if you don’t bring staff along with the process it will fail in the medium term. Our research shows that you need to re-launch the whole process about a year after the initial launch to keep it moving. This is backed up by what our customers tell us they need to do. It’s not enough to launch the process and promote it in the company newsletter once. You need to tell people and then tell them again and again, in different ways and at different times. The statistics for NPS sample sizes and margins of error are different to normal surveys because of the “Net”. You generally need larger samples to get the same statistical significance for NPS than simple customer satisfaction. In order to ensure you don’t make false positive errors (detecting changes when none exist) you should get a good handle on exactly what changes in your NPS are significant and what are not. Apparently I’m a bit famous for being anti -NPS benchmarking. It’s not that I don’t think it’s useful. It’s just that that 99% of companies think it’s as easy as grabbing a score from some published “benchmark report” and looking up companies in similar industries to compare to their own score. It’s not. If you do NPS benchmarking right you’ll be fine but if don’t want to make that investment, just benchmark against your own score last month or quarter. Doing it that way will get you most of the value of benchmarking for a fraction of the cost. The only valid comparison of NPS is to your past trend. Cross-company comparisons are sheer folly. But if you must compare — and we know the C-suite will do it — you must use the “standard” scale, anchor choices, and administration mode. Different scale lengths, anchor choices, and admin mode — along with the placement of the NPS question in the survey instrument — will all affect the responses. Running a transactional NPS process generates a LOT of data and there can be a tendency to not read all of the text responses from customers. Don’t give in to that tendency. For a start, the customer invested their time providing the response, the least you can do is spend a few seconds reading it. But, more importantly you will be missing some key opportunities. One organisation found that 3-4% of transactional customer feedback comments will be directly actionable. That means 3-4% of the comments are items that you can fix or resolve for your customers immediately. Following through on feedback from customers is a very powerful way to improve their opinion of you. More than that, the same company found that 1 in 1,000 comments are the seed for a substantial discontinuous innovation for your company. I’ve talked before about discontinuous and continuous innovation and how, generally, transactional feedback systems lend themselves to more continuous innovation. So new piece of evidence showing that an organization can use this process for discontinuous innovation was eye opening. Summary: make sure you read all your comments or miss the opportunity to fix problems for 4% of your customers and those 1 in a 1,000 opportunities for dramatic improvements in your business. Share the customer verbatim comments with the entire organization – your next great idea can come from anyone. My two cents: The idea of transparency of this data across the organisation is key. See later for a best practice in this area. Although Net Promoter is most well known as the “the one number you need to know” the survey needs to have more than just one question. On the other hand don’t go overboard. You should able to collect all of the information you need in a just a few questions and certainly no more than 10. Check out the perfect Net Promoter score survey for more information on how to structure your survey. 23. 0 is a Special Number so Act on It. 1 may be the loneliest numbers but in NPS, 0 is a special number. Our analysis indicates that, typically, there are more zero responses than you would expect. In addition, people who score you a 0 are generally still engaged with your brand so you can use a good service recovery process to turn them around. So, don’t ignore the people that give you zero. Reach out to them as they are still engaged and, if treated right, can become you most ardent supporters. 24. Link Net Promoter to a Continuous Improvement System. Net Promoter is a great way to collect information about your business but you need to turn that information into action. Partnering the Net Promoter process with a quality system is a great way to do that. There are many options: 6 Sigma, Lean 6 Sigma, ISO9000, Total Quality Management, etc. The best practice here is to implement the core elements of one of the quality systems in your business to make sure that you able to consistently drive continuous improvement. You should not feel the need to, for instance, implement the full Lean 6 Sigma process across the company. However, you should certainly obtain training in some of the core tools of quality systems in the root cause analysis and action planning. For instance you can implement Plan/Do/Check/Act, the five Whys, etc. There are many other quality tools that you can seek out to give the staff in your organization the tools and techniques they can use to extract the maximum value from the NPS information. It’s a simple thing but our research shows companies that report at least monthly on customer feedback data have more successful programs than those that don’t. So make sure that you share data at least every month. 26. Link to Remuneration but Take Care. Staff know that sales are important because you link commission payments to them. They know costs are important because you have targets for ongoing cost reduction in the business. So, if you don’t link NPS to staff incentives it will be clear to them that it is not important. However, you need to be very careful putting in that link to ensure that you don’t create a culture of score begging. Staff need to view the feedback as a way to improve and that will only happen if management use it constructively. Transactional surveys are very useful. In your business you already know a lot about the impact of internal tasks on your company. You know how much it costs to make your widget, how much your retail location cost per square metre (or foot), and the average sales that each person makes. What you often don’t know is how your customers perceive your business. However, by instrumenting your customer journey using transactional NPS you can get a deep understanding of how customers perceive each and every interaction with them in your customer journey. The NPSs along the complex journey will allow you to not only diagnose the overall performance, but where you are doing well / poorly and the relationship between one touch point success and the likelihood the customer will move to the next. If you only survey those customers who complete the whole journey, you have a sampling error that excludes customers who drop out and you are likely looking at artificially high scores. Ignore them. The data is almost certainly not a valid comparison to your business – see benchmarking above. When launching a customer feedback program there can be a reticence by some managers to share the information deeply and widely within the organisation. This is justified in a variety of ways including protecting staff from negative feedback. Push through that reticence and make all data publicly available to anyone in the organisation who wants to see it. The experience of our customers in this area is clear: if you are completely transparent in the sharing of customer feedback you staff will value the process. If you hide some of it you will lose their trust and engagement. Sure there will be negative customer feedback and you will need to counsel staff in how to respond and positively interpret that data but overall the benefits of complete transparency far outweigh the costs. Make sure that service recovery is one of the very first processes that you implement as you roll out NPS. You win back customers and they are more loyal than ever. Maybe this doesn’t seem like a Best Practice tip, more like stating the obvious, but you’d be surprised how many organisation set up their data collection systems and report like crazy but never actually make a change in the business. If you do not use the information to make changes in the business, shut down the whole process because it is just a waste of time and money. In order to invest in your customer experience you need to understand what the return on that investment will be. The only way to run those calculations is if you know the value of a Promoter and of moving a Detractor to a Neutral to a Promoter. These calculations are not complex and can often be done in Excel with a little thought so don’t let the statistics worry you. For example see this case study for one of our Australian customers: nib health funds</a> . In this case study we were able to determine the impact a 1 point change in the “would recommend” response had on the attrition propensity of a customer. With this information plus knowledge of the average customer life-cycle and revenue/profit per customer gives you a very accurate understanding of the value of a Promoter. This information is vital when you need to develop NPS business cases or establish proof cases for management that demonstrate the value generated through your Net Promoter activities. If you never calculate this information you will forever be arguing IF Net Promoter dives any business value, rather than HOW MUCH value it drives. Whatever system (software plus process) you choose to collect and report on customer feedback you need to ensure that everyone in the organisation has confidence in the data that is reported. If there is any gaming of the system or people don’t trust the reports that are generated, it dramatically shifts focus of analysis. If people trust the data then they are focused on identifying the root causes to drive improvement. This is the good outcome. If people don’t trust the data then they are focused on proving that their score didn’t go down or did go up. This is the bad outcome. Make sure your staff are focused on the right thing. Think of it this way: if I sold your marketing group a piece of software that would assign a “propensity to purchase” ranking to everyone in your customer database they would pay a fortune for the data and spend all their time marketing to the high propensity customers. In reality this is exactly what each customer is doing by filling in an NPS survey but very few organisations actively use the information in marketing to their customers. One organization targeted Promoters, Neutrals and Detractor with different marketing campaigns. The Promoters were sent a thank you email that included three vouchers: one for themselves and two to pass on to friends. The results were nothing less than extraordinary. Traditional marketing metrics (click through rates, open rates, conversion rates) were almost an order of magnitude higher for this campaign, with hundreds of percent improvements. In addition the “pass on” vouchers were indeed passed on and not only generated more sales but sales to new customers. This is an excellent approach but you do need to take some care that you don’t train customers to give you good scores. Such a program needs to be kept confidential and implemented randomly so you don’t find people giving the organisation better scores in order to receive vouchers. Doing that would dramatically reduce the ability for the customer feedback program to drive long term business improvement. For many, most, almost all, companies, after you fill in the feedback form that’s the end of the process. You never hear anything about the survey again. Telling customers that you have heard them and are actively considering their input sets you apart from your competitors. The process of telling does not have to be complex. It can be as simple as a follow-up email to respondents letting them know what is being done based on the feedback collected. You don’t need to respond individually to customers, although you can, simply roll up the ideas and changes that you are making into a more general list and send an update to all customers. Many people feel that governance is a boring subject and one on which they don’t want to spend any time. However, I know from experience, that organisations that do not create some type of Steering Committee or oversight process will fail to make consistent use of the information collected in the Net Promoter process. The process will not fail immediately; it generally takes 12 or more months, but it will fail eventually. While the whole organisation needs to be involved, if there is no one person or small group to drive the process and support the rest of the organisation, Net Promoter loses focus. It tends to become just another metric that is collected but not actioned. Pretty soon the whole focus is on the number and not the change that it is driving; at which point the process in in danger of being cancelled as not relevant. If you give the Net Promoter program cross functional support it will be very much more effective than if you make it one person or team’s task. That means that people from all across the organisation should be involved with and in the data collection, analysis and action process. If you make NPS the task of one group (Strategy, Marketing, Operations, Customer Services. etc) it will fail because everyone is expecting that group to “fix NPS”. Certainly you need a central person or group to own the process but everyone in the organisation needs to be part of the process. If you don’t have a central process management ownership everyone assumes someone else is going to organise the meetings, etc. We stress to our customers that they should ensure the teams working on Net Promoter be drawn from people throughout the organisation to gain the benefits of cross functional support. Interestingly some have told us that the reverse is also the case: the Net Promoter process has helped them to break down silos within the organisation as diverse groups of employees come together to focus on the customer. This is a double win: improving the customer experience and breaking down the silos in the business. Segment – Not all of your customers are the same. This is the first step to understand where your bad profits are coming from. My Two Cents: Dale is spot on here. When reviewing your NPS data make sure that you do so in context and with an understanding of your different customer segments. Customers that want high levels of custom help may give you low scores for your self serve service but other customers may give you high scores for the self same service. One of our customers had exactly this issue. In their case it was not that the service was poor but how the segment used it was unexpected. If you don’t examine the data in concert with the segments you will miss these sorts of important insights. The urge to graph and compare scores for all the different parts of the organization can be very strong but you need to ensure that you only compare (in absolute terms) suitability similar parts of the company. For instance you should generally not compare the absolute score of different countries because there are cultural differences which mean scores for different countries will be different for the same organization. Also consider whether it is useful to compare directly, say, sales and customers service areas of your organization. In summary, take care what you compare in absolute terms. While you need to take a great deal of care in in comparing absolute scores you can and should look very carefully for trends in the data. As I have noted many times the most important benchmark is the score for the last month or quarter for the same part of the business. The trend is your friend. Look to it for confirmation that what you are doing is driving real change it the score. When doing this you should ensure that the change you see is statistically valid. Net Promoter for instance can be difficult to identify statistically valid changes in the score because of how the score is derived. To make it easier we have a free Excel download Net Promoter Comparison Tester that you can use to determine if the change between two NPS® is likely to be statistically valid. You can also use the rule of 7 from control chart theory to say that if the score rises or falls in a run for 7 more more data points then there is a real change occurring in the data. NPS is a very good metric but you should ensure that you also provide other business targets: NPS is not everything, it is a predictor of revenue. This makes sense is you consider what would happen is you decided to just focus on NPS to the exclusion of profit. It is very easy to have very happy customers if profit (or cost) is no object. As a result you need to provide staff with other goals (generally cost or profit targeted) that build a creative tension in the identification and implementation of solutions to improve NPS. This can be, say, average handle time in call centres, or gross margin in sales organization, etc. Adam, you have done all of us a great service by pulling together this information from some of the top people in the customer service world. Thank you! Shep, I was just glad to hear their great insights but thank you. Can you please fix the ‘you’ to ‘your’ in best practice number 4? Adam — thanks for that pickup. Fixed. Great, great compilation – probably the best on the web I’ve seen until now! I believe that one of the best benefits the NPS framework brings to companies is why clients are giving their ratings. This open-ended follow-up answers are business golden nuggets Besides being fundamental in root-cause analysis, they can bring powerful insights that your company either didn’t know or was not paying the necessary attention to. Thus, in your surveys, really try to persuade clients in informing WHY they gave their rating. At FanExam, we do this by automatically identifying text input on web surveys and adding custom messages. For example, in surveys used by our SaaS clients, if we see that a user gave a high rating and as a reason for that rating they said “nice features”, be automatically present a message asking them to elaborate on which is their favorite feature before they submit the form. Clients will usually elaborate and everyone wins. I agree that Why is critical to the process. Good survey designs (The Perfect Net Promoter® Survey Design) need to take that into account. They are not very supportive of the approach.